Clean Sweep At Asian Golf Awards! Clean Sweep At Asian Golf Awards! Clean Sweep At Asian Golf Awards! The giant Mission Hills Group of China, the world’s largest golf resort pulled off yet another clean sweep at the 2018 Asian Golf Awards held at the Hyatt Regency Bangkok Sukhumvit in Thailand. 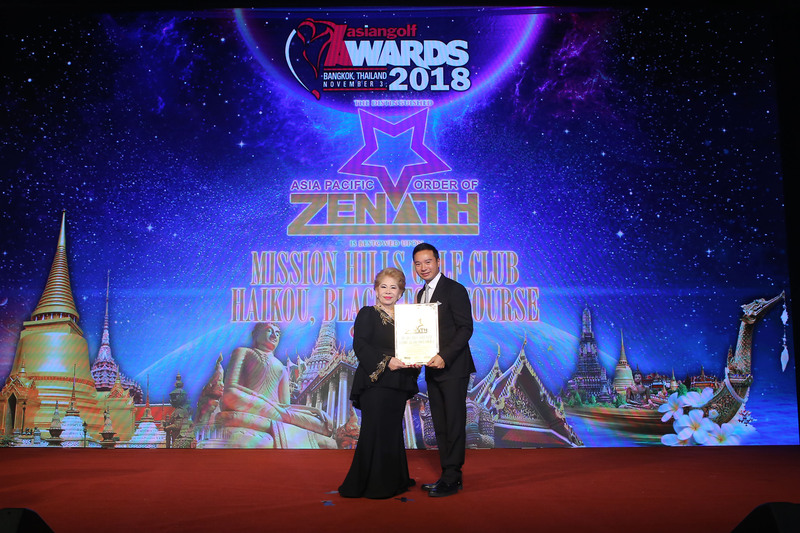 The two top awards that Mission Hills won was the Asia Pacific Order of Zenith, the highest award for golf club in the Asia Pacific and the 2018 Asia Pacific Custodian Of The Environment Award. Tenniel Chu, vice-chairman of group is pictured receiving the Order Of Zenith Award from Angela Raymond, president of the Asia Pacific Golf Group.